Surprisingly good birding for the middle of Jakarta! Worth a morning just for Sunda Coucal. Muara Angke Nature Reserve lies at the mouth of the Angke River in north-west Jakarta. It was formerly surrounded my more marsh land to the west, but has now become surrounded by housing estates. Despite having urban developments on all sides, and despite the river resembling an open sewer at times, Muara Angke remains surprisingly good for birding, and is probably the easiest place in Indonesia to see Javan Coucal. At the end of 2014 the reserve was closed because the boardwalk had become too dangerous. Official access at one time was to obtain a permit from the Forestry Department Office in Jakarta (an address is given in the comments section below). Unofficial access to visitors has it seems on occasion been granted since the closure, through the staff on the gate. Comments below suggest that the boardwalk was in the process of being repaired in 2016, with new higher ticket prices for visitors, and the continued uncertainty of whether a permit/ticket is required from the Forestry Department, or whether access can be officially granted at the gate. When the raised board walk is repaired, this provides the best birding. If you can access the ‘beach’ and get views out into Jakarta Bay you may have a chance of seeing Christmas Frigatebird or Aleutian Tern. Yet another alternative is to try and hire a small boat and take a slow ride along the river. This is another good way to look for Javan Coucal. All else failing, viewing the marsh from the main road at dawn, particularly around the entrance can be good for Javan Coucal. Other birds to look out for here include Black-winged Myna. A small population of this increasingly rare species has been present for a number of years. Their provenience is unknown, but they are of the western form, so who knows? Muara Angke used to be a pretty reliable site for Javan Plover also, but as the housing estates have developed around the reserve they have become less and less likely to be seen. Far better sites exist to see Javan Plover nearby (such as Pulau Dua, Pulau Rambut, Pamanukan), so if you don’t connect at Muara Angke best try one of the alternatives. Other interesting birds that can be seen in the reserve are Black Bittern, Cerulean Kingfisher, Chestnut-winged Cuckoo, Javan Myna, Duarian (Purple-backed) Starling, Yellow-rumped Flycatcher and possibly also White-capped Munia. Records of Javan White-eye have been provided recently on eBird (2016). If you are on your own trying to find Muara Angke, a taxi is probably the most efficient way. However, despite being in the middle of Jakarta, few taxi drivers will have heard of ‘Muara Angke’. A better bet is to ask for ‘Pluit’ or ‘Pluit Mall’ and then when you get there try and get the taxi driver to ask a local for the reserve (try asking for “taman burung” or “taman alam”) or the road that the entrance is on ‘Jalan Pantai Indah Utara II’ (means literally ‘beautiful beach road’!). From central Jakarta the ride to Muara Angke will take around 40 mins, depending on the traffic. From the airport the time is around the same. Scroll down the page for related information, including photos, comments, trip reports, guides and services, articles and news. Please help others by leaving a comment if you find anything different to the way it is described. Last updated: Jan 2017. 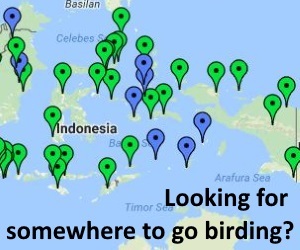 Enrico, I have seen at ebird you are entering regularly to this site, Muara Angka. I am going in a short birding trip to that area at the end of June, are the problems to go in solved? Do you suggest me to go? Thank you in advance. 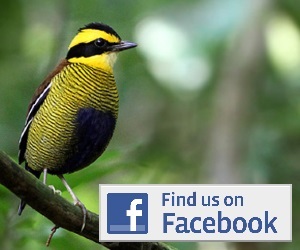 Hi Ignacio, I am also planning to go for Birding at Muara Angke this weekend and next. So if would like to join then do let me know. Maanikkapoor@outlook.com. It seems that Muare Angke has reopened and ticket prices have been established at a hefty 250.000 Rp for foreigners. However it is still not possible to formally arrange ticket at the entrance (visit to Forestry Office required). Park rangers offered me to pay the fee at the entrance, but refused to provide a receipt. I declined as I did not want my conttribution to end in the wrong pockets. Raners indicated that formal ticket purchase at the entrance might be possible 1-2 months froom now. Unfortunately missed the coucal…. In the past I managed to do so, but the last 2 years they have made it impossible, with countless requirements. It is a waste of time dealing with them there. The staff will normally take IDR 50k and let you in. Any updates on access fees? I am planning a visit in August 2017 and would like it go as smooth as possible. I visited Muara Angke from 6.45am to 9am on the 17th of July 2017. At 6.45am the main entrance didn’t look open. I birded the riverside till 7.45am nearly back to the entrance by walking down right beside the river from the bridge. Didn’t see the coucal, but I should have come an hour earlier to be there at dawn. I then went to the main entrance. As best I could gather a permit is still needed, but can be paid for at the entrance, but I am not sure of this since I didn’t try to get the permit. The cost of 250000 idr was too much since I thought (incorrectly) that I would be able to see in from outside the reserve. I walked the edge of the reserve to near the shoreline. I never found anywhere that gave good views into the reserve and basically couldn’t see in except at a couple of spots. I am pretty sure the foot trail indicated on the map no longer exists. Seemed completely overgrown where I tried to find it. The boardwalk at the beach had a security guard who, as far as I could tell (given that I can’t speak Indonesian at all), wanted a permit from the main entrance for me to use the boardwalk. It didn’t seem to be possible to get a permit at the beach boardwalk. Thanks for sharing with us. You have to make the permit first if you want go there and today you can’t just enter to that place and it can’t get permit in that place. You have go to the the office in Salemba, Jakarta (http://bksdadki.com/page/perizinan). I also tried the path around the reserve back in 2015 since the park was closed and there was no one at the main office. It is nearly impossible to walk around now and there are very limited possibilities to observe birds from outside. Maybe that part of the description should be deleted. I have visited the Coucal stake out on the 22 july and it was walking along the bank of the river about 20 metres away within some planted banana trees just before sunrise at 5.45am. Didn’t stay longer as I wanted to leave for Pulau Rambut but the gate for the boardwalk was locked around 6.30am! Hi everyone, what’s the latest update with regards to the accessibility of Angke? Can you pay for access to the boardwalk on-site, or will need to visit the forest department beforehand? Any new updates regarding a visit to the park. I am in Jakarta now and I’d like to visit coming tuesday. You’ll need to visit the forestry department in Jakarta to arrange permits before you visit. Not sure of the cost unfortunately, but will definitely do it next time I try to visit. The boardwalk is extremely fragmented and in a pretty bad state — still passable if you make a concerted effort and have good balance, but definitely a safety hazard. We had luck with the Javan Coucal which still seems to be doing very well in the area with a few calling a birds in the early AM (4-5am), with the first flight view of the birds around 5:30, we managed a good view of a bird perched on a tree at 5:50am. Other notable birds seen include Oriental Darter, Black Bittern, Black-crowned Night Heron, Racket-tailed Treepie, and Sunda Collared Dove. The state of the boardwalk prevented access to the northern portions of the sanctuary, closer to the sea, which is where Small Blue Kingfisher can be seen. I’m told that these northern areas also have potential for the remaining Black-winged Myna, and require a boat for access. Comments, requests, questions & feedback! Copyright © 2019 Burung-Nusantara / Birds-Indonesia. All rights reserved.